In The Twilight Saga: Breaking Dawn – Part 2, Bella (Kristen Stewart) awakens transformed. She is now a mother and finally… a vampire. She is enjoying her new life and new powers, after the birth of their daughter, Renesmee. 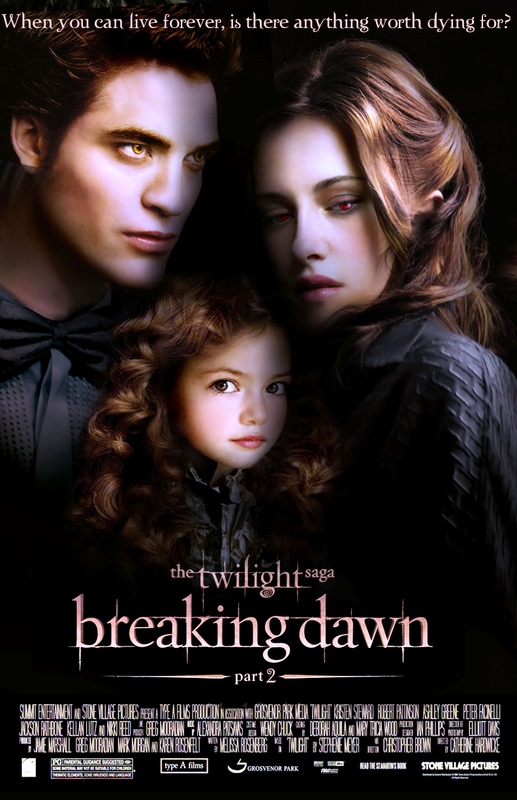 While her husband Edward (Robert Pattinson) delights in her beauty, speed, and uncommon self-control, newborn Bella has never felt more alive; and the destiny of her best friend Jacob Black (Taylor Lautner) has become entwined in that of their exceptional daughter Renesmee (Mackenzie Foy). The arrival of a creature so rare cements an extended family, but their family bliss is threatened again, by a new menace. Vampire Irina believes a child like Renesmee could challenge the power and existence of the Volturi. As Irina rallies the Volturi to destroy this potential threat, Bella and the Cullens – together with any allies they can assemble – are preparing to fight a crucial, ultimate battle, to protect their family. This is the best of the franchise (Yes, thou I don’t go to the movies to watch, I’m a pirate. :P) Perhaps it’s because Bella is no longer the weakling needing protection but a fierce girl power with the capability to protect her love ones. Maybe I’m a lil sadist, but the vampire-head ripping thing was amazing. Twilight Saga Breaking Dawn Part 2 is out now in the cinemas. Read my review about GV @ City Square Mall here. *Disclosure: Event invitation from Golden Village, thanks to omy.sg.